Four-color process printed on both sides of 120lb C2S White Gloss stock coated with Aqueous Gloss. This photo folder design from Radio Disney uses bright, vibrant colors and a futuristic club aesthetic to appeal to its young audience. 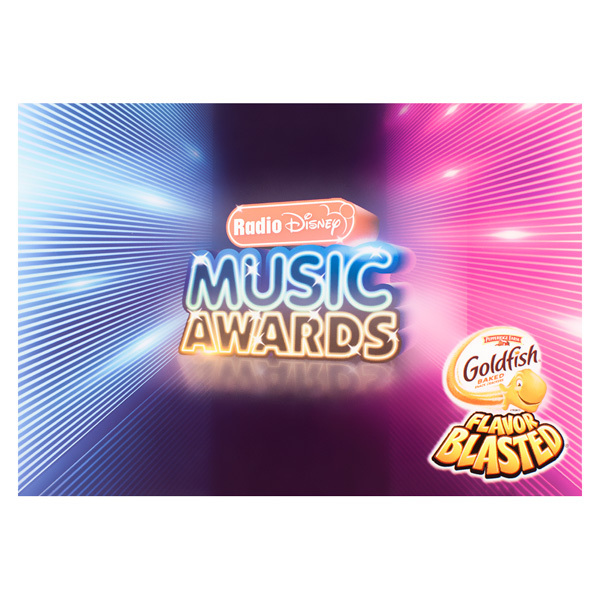 The front and inside features a friendly logo from the event's sponsor, Goldfish. The back of the folder advertises Goldfish's promotional game, "Monkey Dream." The fun, cartoony illustrations create a comforting and whimsical look. 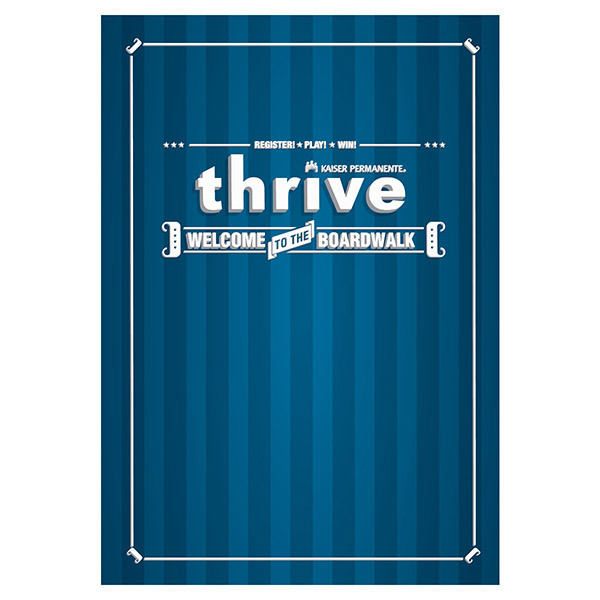 This playful photo folder eschews the clinical look of other healthcare providers with its light and dark blue stripes resembling an old-style carnival booth. Distributed at Colorado's Boulder Creek Festival, this design celebrates food, fun, and friendship with a photo taken by a Kaiser Permanente employee. On the back cover, an artistic word cloud of brand-related terms replaces the vertical stripes. White text gives recipients tips for healthcare shopping and access to Kaiser's social media sites. The information's placement on the back panel makes it easy to access, yet covert when displaying the photo. Four-color process printed on Side 1 of 12pt C2S Semi-Gloss stock. Coated with Aqueous Gloss. 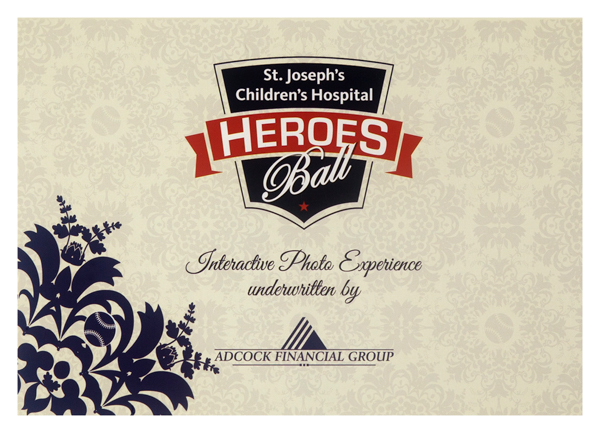 Philanthropists can commemorate an evening at the Heroes Ball with a photo taken by the St. Joseph's Hospitals Foundation. The event's shield-shaped logo alludes to donors' roles in healing sick children. A black floral pattern borders the photo for a vintage look when paired with the tan frame. The children's hospital and foundation contact information are both included on the back for those who wish to donate. The front cover of this design is stamped in Metallic Brass foil, which fits with the industrial imagery. A series of gears leads from the top of the panel to the bottom. 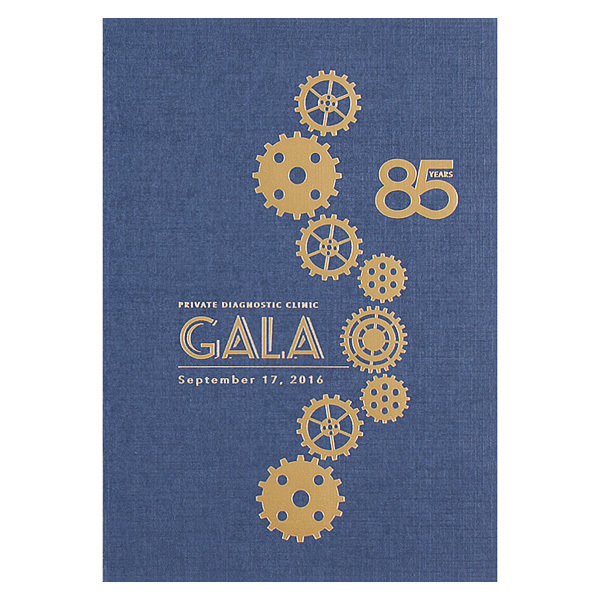 Along the way, readers discover the design is for Private Diagnostic Clinic's 85th anniversary gala. A combination of slim sans serif fonts and a larger display font uphold the design's modern theme, symbolizing technology and ingenuity. Deliver and display a 4" x 6" portrait with this self-supporting product. The closable cover protects the photo while moving from one location to another and creates suspense for recipients, who won't know what the picture is until they open the design. When open, the product stands upright on a shelf or desk to showcase the image. Customize the outer cover or frame with text commemorating the event where the photo was taken. Dimension Closed: 4 3/8" x 6 1/4"
Dimension Open: 8 23/32" x 6 1/4"